ligament. AITFL runs from Chaputs tubercle on anterolateral tibia to Wagstaffe's tubercle on anterior lateral malleolus. PITFL runs from posterior malleolus ie Volkmann's tubercle. saphenous nerve and posterior tibial nerve medially. Saphenous nerve runs with long saphenous vein in front of medial malleolus usually dividing into two branches running on either side of the vein. Saphenous nerve supplies medial NWB side of middle and hind foot. planter flexion causes IR of talus. Dorsiflexion causes ER of talus and posterlateral translation and ER of fibula. fusion=neutral dorsiflexion, 5-10°valgus, 5-10 external rotation, neutral mediolateral displacement, posterior translation of the talus with respect to the tibia of 1cm. medial and lateral plantar nerves (from tibial N) supply sole of foot. saphenous nerve supples medial border of foot. superficial peroneal nerve supplies majority of dorsum of foot. Posterior malleolus is the attachemnet site for the posterior talofibular ligament. A/P, Mortise(A/P in 20 IR), lateral. full length tib/fib films if proximal fibula is tender to evaluate for Maisonneuve fracture. fibular shortening by looking for a step in the alignment of the subchondral plates of the tibial plafond and the lateral malleolus. Stress radiograph: leg stabilized in 10 degrees IR to obtain mortise view. With ankle in neutral dorsiflexion an 8=10lb ER force is applied to the ankle. Positive finding is medial clear space of >4mm and >1mm greater than the superior joint space or any lateral tibial subluxation. 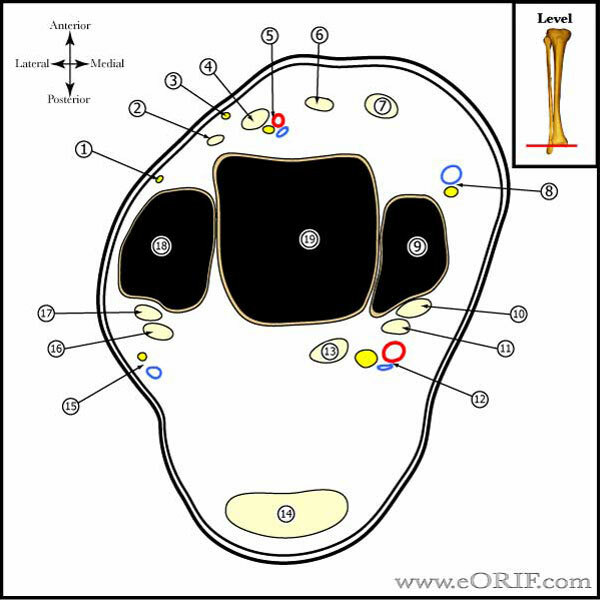 ORIF indicated for positive stress radiograph. (McConnell T, JBJS 2004; 86A;2171). Gravity stress radiographs may be equally as sensitive with less pain. talocrural angle = 83 +/- 4, lesser or greater indicates instability or displacement of the mortise. 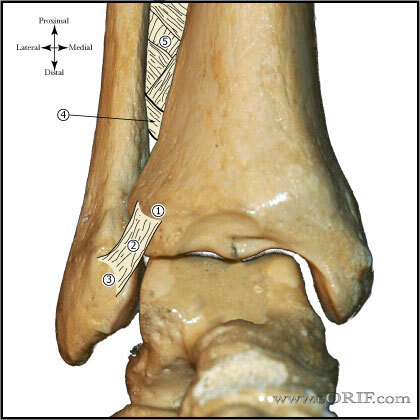 Angle is formed by lines drawn along tibial plafond and a line drawn along the tips of both malleoli. the space between the medial wall of the fibula and the incisural surface of the tibia should be <5mm. Anterior tubercle of tibia should overlap fibula by at least 10mm. joint space from between talus and plafond should equal space medial malleolus and medial talus. Widening of medial space indicates mortise displacement. lateral view demonstates fibular fracture pattern and anterior or posterior displacement of talus. tibiofibular distance should be 3.7mm =/- 0.5mm, 1cm above the joint. Occult ankle fx suspected if total joint capsule distention (ant + post on lat view ) is 15mm. PPV = 83%, sensitivity = 86%. CT if occult fx suspected. -Treatment =ORIFdue to high incidence of nonunion ( 5-15%nonunion if >2mm displaced). May consider conservative treatment (Herscovici D, JBJS 2007;89Br:89). Trimalleolar- ORIF fix posterior malleolus if >25% of plafond (Scheidt, J Trauma 1992;6:98), Strongly consider CT scan to determine posterior malleolar fracture size. 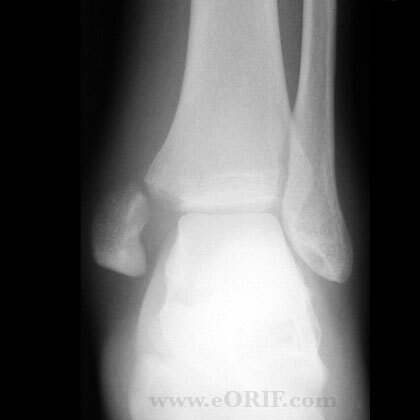 Syndesmosis injury:if medial clear space increases with external rotation stress, or fibula fx >4.5cm above joint; ORIF of Medial Malleolus Fracture, fix syndesmosis in dorsiflexion with fibula reduced into incisura fibularis, HWR after 12 wks. Pronation-external rotation (7-19%)4 stages-(1)fracture of medial malleolus or rupture of deltoid ligament; (2)rupture of anterior tibiofibular ligament and interosseous membrane; (3)short spiral oblique fracture of the fibula above ankle joint; (4)rupture of posterior tibiofibular ligament or fx of the posterolateral tibia. Controversion: mechanism have come into question recently. (Haraguchi N, 2009;91A:821). Volkmann's fracture=fracture of the posterior articular lip of the tibia. Reduction: should be performed as soon as possible to decrease potentials for presure ischemia, vascular compromise or articular injury. Done under conscious sedation or local hematoma block. Ankle block = 12ml 1% lidocaine; 20-gauge needle inserted just medial to the tibialis anterior tendon at the level of the ankle joint (White BJ, JBJS 2008;90A:731). Syndesmosis injury (Boden SD, JBJS 1989;71A:1548). Diabetics with comorbidities have higher complication rates; significantly higher in-hospital mortality rate, in-hospital postoperative complication rate, length of stay, and rate of nonroutine discharges. Complications include impaired wound healing, infection, malunion, loss of reduction, hardware failure, nonunion, and Charcot arthropathy (Jones KB, JBJS 2005;87Br:489), (Chaudahary SB, JAAIS 2008;16:159). We discussed the risks of surgery including, but not limited to: incomplete relief of pain, incomplete return of function, nonunion, malnunion, painful hardware, compartment syndrome, CRPS, DVT/PE and the risks of anesthesia including heart attack, stroke and death. 7-10 Days: Wound check, functional Air-Stirrup ankle brace (Aircast). Partial weight bearing as tolerated. Encourage daily active and passive range-of-motion exercises of the ankle and subtalar joints without the brace. 6 Months: Return to sport / full activities. 1Yr: Assess outcomes, F/U xrays. See Ankle / Foot Outcome measures. Stiehl JB: Medial Malleolus Fractures with diastasis, in Greene WB (ed): Instructional Course Lectures XXXIX. Park Ridge, IL, American Academy of Orthopaedic Surgeons, 1990, pp 95-103. Phillips WA, Schwartz HS, Keller CS, et al: A prospective, randomized study of the management of severe Medial Malleolus Fractures. J Bone Joint Surg 1985;67A:67-78. 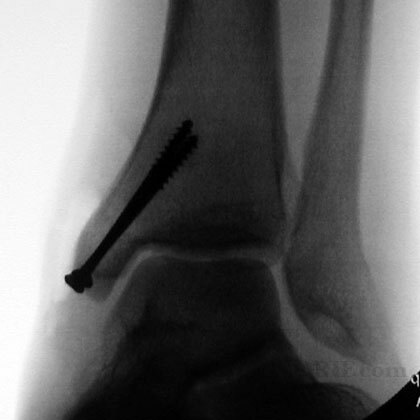 Weber BG and Simpson LA; Corrective lengthening osteotomy of the fibula. Clin Orthop 1985, Oct; (199)61-7. Yablon IG and Leach RE; Reconstruction of malunited fractures of the lateral malleolus. JBJS 1989, April; 71-A, No. 4, pp. 521-527. Michelson, Fractures about the ankle (Current Concepts Review), JBJS Am, 77(1): 142-152, 1995. VanderGriend et al., Fractures of the ankle and the distal part of the tibia, JBJS Am, 78(11): 1772-1783, 1996. Boytim MJ, Fischer DA, Neumann L: Syndesmotic ankle sprains. Am J Sports Med 1991;19:294-298.